The GoPro HERO (2018) is at left, with the HERO7 White at right. 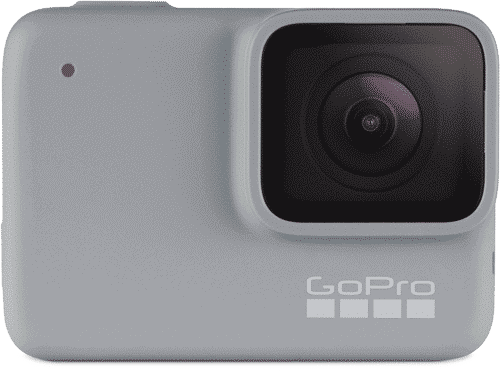 The GoPro HERO (2018) and the HERO7 White are both considered entry-level models in GoPro's lineups. The newest, and technically the current model, is the HERO7 White--it was released in late-September 2018, along with the other HERO7 models. The HERO (2018) is technically an older model, but not by much--it was released only about 6 months earlier. And at the time of writing, at least, you can still find it pretty easily in stock at major retailers. There are several ways that the way in which these models compare isn't necessarily cut and dried, because it's not a linear upgrade path for these ones. So it's not just a matter of looking at what's new and improved, because there are some fundamental differences between them that are worth laying out in detail. And there's one other complication when it comes to the HERO (2018). It's actually a HERO5 Black that has been hobbled in its firmware. Some enterprising users have posted firmware hacks that restore the camera's capabilities, which turns the HERO (2018) into a HERO5 Black. (I'm not going to link to the hacked firmware here for two reasons: because GoPro has apparently been quite aggressively sending Take Down notices and because messing with firmware can brick your camera and I don't want to help you do that. But if you want to try the hacked firmware, you can find it easily with a quick Google search.) In this comparison, I'm treating the HERO (2018) as a HERO (2018), with the GoPro-sanctioned firmware. Comparing the HERO5 Black with a HERO7 White really isn't a fair fight--the HERO5 Black is in most respects a much better camera in terms of its features and capabilities. But not everyone wants to or should try hacking their camera. What I'm referring to here as the HERO (2018) is technically known as just the HERO. But GoPro has used the "HERO" name before, most recently with a camera released in 2014. They've also released older models called the HD HERO, the SD HERO, and the HERO Session. So while its formal name is the GoPro HERO, to make it clearer which model I'm referring to I've adopted GoPro's convention of referring to the new model as the HERO (2018). And if you're looking to buy the HERO, either new or used, take extra care to check that it's the most recent model and not one of the older ones. In broad strokes, they're very similar on the outside. They both have a very similar body that's' rugged and waterproof (both rated down to 33 feet (10 meters). They're different shades of gray, but they're basically the same size and share a very similar outline, at least from the front or the back. They have the same sized screen on the back (2-inch). And the same basic layout of controls, with the shutter button on top and power button on the side. The view from the top. There's a minor difference with the way the shutter button is fused to the body wrap on the HERO7 White, but it's functionally the same. You can see the ribbed or corrugated texture on the body of the HERO (2018). GoPro has done away with that in all the HERO7 cameras. In terms of size and weight, the HERO7 White is a little lighter. I measure the HERO7 White as being 3.2 ounces (92 grams), while the HERO (2018) with a battery and memory card installed is 4.2 ounces (118 grams). The bottom of the cameras. The bodies are mostly the same size, with the exception of the depth where the lens port is. Both of these cameras have aggressively simplified options when it comes to shooting video. Neither has anything like the huge range offered by the Black editions. That's by design, and it does have an upside: it makes things much simpler to use, with little chance of getting bogged down with too many choices and wondering which settings to use. 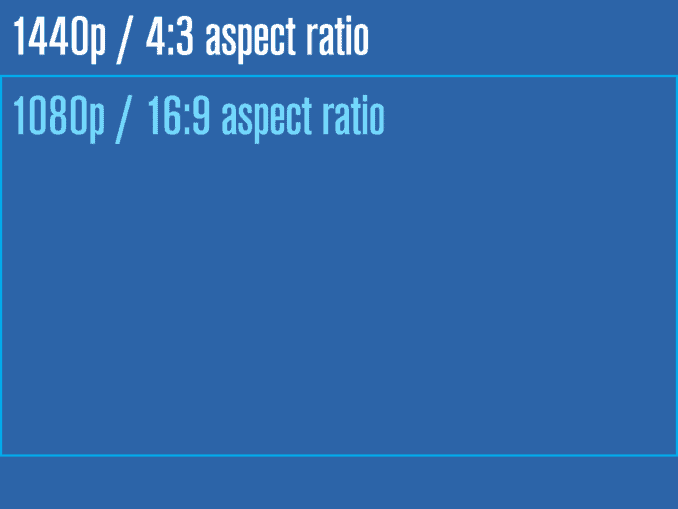 On the HERO7 White, there are only four combinations of resolution and framerate available. In NTSC, they're 1440p30 and 1440p60. In PAL, they're 1440p50 and 1440p25. The HERO (2018) has more video resolution/framerate options, but only barely. It can shoot in both 1080p and 1440p. For each of those, there are four possible framerate options (60fps and 30fps in NTSC mode and 50fps and 25fps in PAL mode). I find the way in which you switch framerates in the HERO7 White to be a bit odd. There's no option in the menu system for you to select the framerate. Instead, you have to hit the snail icon on the main screen. That denotes the slow-motion mode (or Slo-Mo, as GoPro puts it) and does the faster framerate options (60fps in NTSC and 50fps in PAL). Calling that slow motion is a bit of a stretch, but that's how you switch the framerates. Stabilization. The in-camera video stabilization that GoPro's have incorporated in recent models makes big improvements to the footage that you get out of the camera. It's an electronic stabilization, which isn't as effective as a good external gimbal, but it's still a very convenient and effective option to have built in. Both of these models have stabilization built in. It's basically the same generation of stabilization in each--neither has the much more aggressive and effective new generation called HyperSmooth that's used in the HERO7 Black. There's one notable difference with how it's implemented in these two cameras, though. On the HERO (2018), you can turn the stabilization on or off. On the HERO7 White, it's on all the time with no way to turn it off. For most users, that's not an issue, and having always-on stabilization is the best way to go. But there are some situations you might want to turn it off. As an example, if you're using an external gimbal like the GoPro Karma Grip, you'll probably get better and more consistent results if you turn off the internal electronic stabilization. So it's good to have that option on the HERO (2018), but the HERO7 White isn't compatible with the Karma stabilizer for a different reason--the USB-C port is in a different place so the camera won't connect. File Formats, Bitrates, and Codecs. Both cameras use the standard H.264 codec that saves as .mp4 files. That's by far the most widely compatible way to do it at the moment and can produce excellent results. If you're sharing the footage on YouTube, Facebook, Instagram, or any other video service or social media, it's going to work well. Fields of View. On the HERO7 White, there's only one video field of view, or FOV, available: Wide. That's the ultra-wide-angle distorted fisheye look we're used to seeing from GoPros. On the HERO (2018), you have a choice of Wide, Medium, or Narrow. These are all applied digitally--they're not the same as an optical zoom. Neither of these cameras have the Linear FOV which corrects for the fisheye distortion and is particularly useful when shooting aerial footage from a drone. Protune. Neither of these cameras have Protune. Protune is GoPro's name for their collections of advanced, expert options that give you more control over the shooting settings and can open up higher-quality modes. I have more detailed information in it here. Digital Zoom. The HERO7 White has a digital zoom feature that makes the subject larger in the frame. It's not an optical zoom, which is what we'd consider a true zoom; it's basically glorified cropping. Having the feature available doesn't do any harm, and it can be convenient to have it if you're looking to share the video with minimal editing, but it's not something I use often or find to be a compelling reason to choose one camera over another. Vertical Filming. Something new in all the HERO7 cameras is the ability to shoot vertically. It's also known as portrait orientation. If you're not familiar with what that means, think of a smartphone filming held upright rather than laid on its side. It's rotated 90 degrees from what we'd consider normal video. YouTube and some other services have begun fully supported vertical filming, and it's particularly well suited to uses like Instagram stories (or the various other stories format on other social media and news services). When you rotate the camera, it should automatically detect where "up" is and switch accordingly. But I've found the switching to be slow, to the point that I find it to be a minor irritation. Shooting Slow Motion. Both cameras are technically capable of shooting slow motion, but with a maximum framerate of 60fps, it's really only just slow motion. You can slow it down to about half speed, but that's not going to be enough for particularly dramatic slow-motion effects, which really need at least 120fps or 240fps or faster. So if you're planning to do a lot of slow motion, neither of these cameras are particularly well suited to it (the HERO7 Black is the best option for that). HDMI Output. The HDMI port is used to send a video signal directly out of the camera. The HERO (2018) has one (micro-HDMI), but the HERO7 White doesn't. Live Streaming. Neither of these cameras can be used for live streaming. So far, the only GoPro that can do that is the HERO7 Black. Looping. Again, neither of these can be used for looping, which records a chunk of video and then goes back to recording over that. It's a mode that's useful for something like a dashcam, where you want the camera to be rolling but the action you want to capture is only sporadic. In terms of taking photos, there are far more similarities than differences. Nevertheless, there are still a few small differences to note. File Format. Both save the photos are standard JPGs. Neither has the option to shoot in RAW that some of the other cameras have. Burst Mode. Burst mode shoots a fast sequence of shots. It's especially useful when taking photos of fast action. Here, the newer HERO7 White has a slight edge. It can take 15 photos in one second. The HERO (2018) can only take 10 photos in a second. 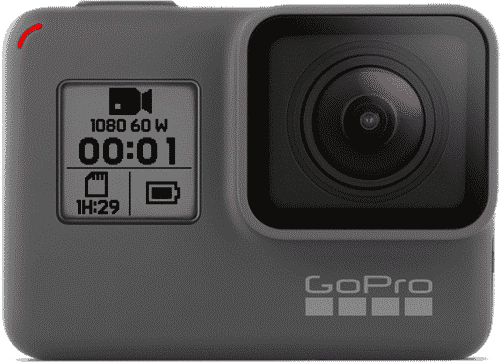 Some other GoPros have other options as well that let you choose from amongst different rates, but these cameras only have a single preset rate. Continuous Shooting. Both cameras have a variation on burst mode that's called continuous shooting. Rather than shooting a preset number of photos in the sequence and then stopping, continuous mode keeps shooting rapidly while you hold the shutter down. It can capture up to 4 frames per second for a maximum of 30 shots. Fields of View. As with the video FOVs, the HERO (2018) has a couple more options. Both use the standard Wide FOV. On the HERO (2018), you can also choose Medium or Narrow. Again, these are digital alterations rather than the result of an optical change in focal length. WDR. WDR is a GoPro's acronym that stands for Wide Dynamic Range. It's similar to the better-known HDR method to restore detail in highlights and shadows, although less effective. It often results in better-looking photos out of the camera (but not always). The HERO7 Black edition has a much more powerful set of enhancements called SuperPhoto. Neither of these photos has SuperPhoto, but the HERO (2018) does have WDR. Night Photo. Neither of these cameras have the night photo feature which keeps the shutter open longer to allow in more light. Photo Timer. It took until the HERO7 range for GoPro to add a self-timer. The H7 White has it; the HERO doesn't. Both cameras can shoot time-lapse, but the HERO (2018) has a useful extra feature. Intervals. The time interval between shots is a crucial aspect of time-lapse shoots. Some GoPros have a long list of intervals to choose from. These don't. They have a single preset: 0.5 seconds. Played back at the standard 30 frames per second, that will speed things up 15 times. Time-lapse Photo. The Time-lapse Photo mode shoots the sequence of photos and then saves the individual photos. To turn it into a video, you then have to download the photos, process them, and use software to compile the video. So it's far less convenient, but it also gives you much more control over the end result. The HERO (2018) can do this; the HERO7 White can't. Nightlapse. Some GoPros have a time-lapse variant that keeps the shutter open for longer so as to work better in low-light conditions. Neither of these cameras has that. TimeWarp. The GoPro HERO7 Black introduced yet another time-lapse variation: TimeWarp. It's a stabilized time-lapse for use when the camera is on the move. So far, the H7 Black is the only camera to have it. Touchscreen. 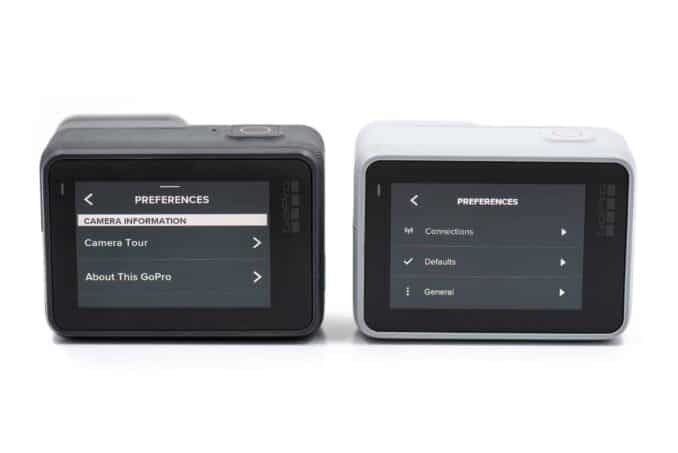 Both have a touchscreen that's used both for through-the-lens live viewing and a touchscreen for accessing the menu settings and various shooting and playback functions. It's the same size screen on both, and there's only minor differences between them. One area that is notable, though, is that the HERO7 range have a tweaked menu system. I find it better and more logically organized, even if it's not perfect. But that really isn't reason to choose one camera over the other. The menu system has been refined in the HERO7 lineup (at right), but it's still conceptually similar. Front Screen. As you can see from the photo at the very top of this page, the HERO (2018) has a small, monochrome screen on the front. 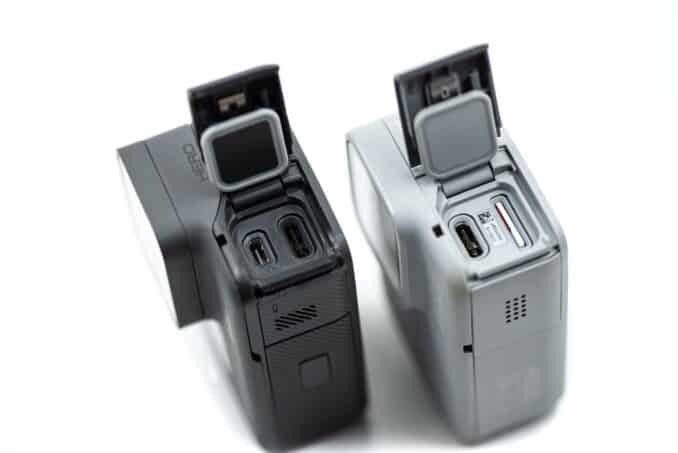 That provides various bits of status information like a battery charge indicator, how many shots left on the memory card, the active capture mode, and recording status. The HERO7 White doesn't have that front screen. Voice Control. 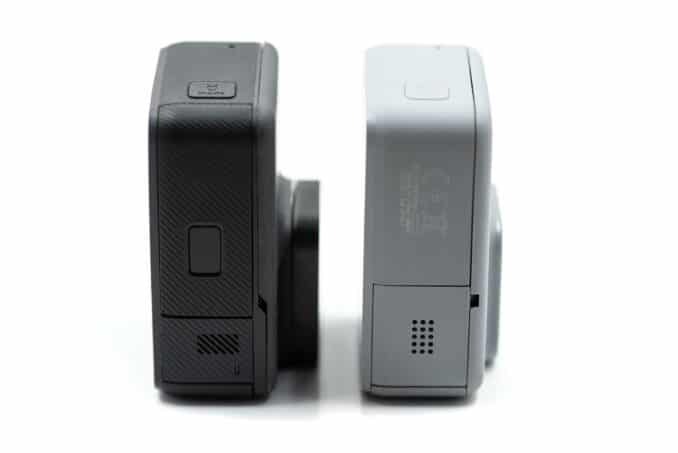 Both of these cameras have voice control, so you can start and stop recording with voice alone. Buttons. Both have the same shutter/record button on top. Both have the power button on the side. The power buttons on the side. Different logo, but same functionality. WiFi/Bluetooth. 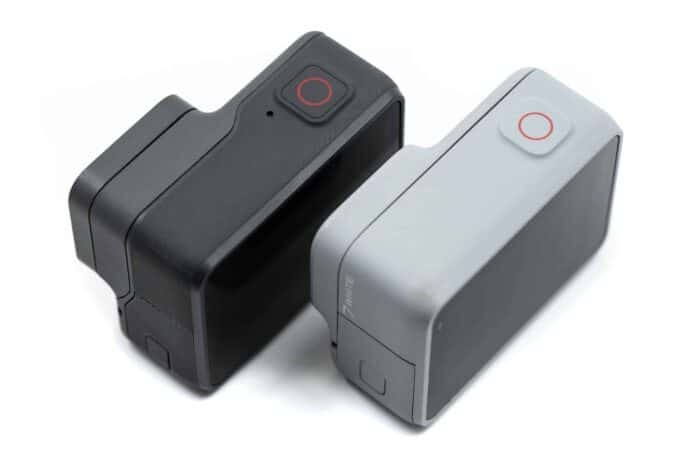 Both of these cameras have wireless features, so you can use them remotely with the GoPro mobile app. But it's important to note that it's a stripped down wireless system: you can use the mobile app, but neither of them will let you connect a GoPro remote. USB. Both have a USB-C port. The side doors. On the HERO (2018) (at left), this compartment has the USB-C and micro-HDMI ports. On the HERO7 White (right), it has the USB-C port and microSD card slot. Because the USB-C is in a slightly different position, the HERO7 White isn't compatible with accessories that use a fused USB-C port, such as the Karma grip and some extended batteries. Battery Life. On paper, they should have similar battery life. Both use a 1220 mAh battery. But in practice, I've found that the HERO7 White has a clear advantage. To compare them, I ran them side by side for an uninterrupted stretch of recording. That's admittedly not how most users are probably shooting most of the time, but it's much harder to meaningfully quantify stop-start recording in short stretches. So I put them on the same settings to make it an apples-to-apples comparison: 1440p60 with stabilization turned on and in the wide FOV. Both were charged to 100%, and they were sitting alongside each other in the same temperature (around 70°F). With the HERO (2018), it ran for 2 hours and 7 minutes, which is about what I'd expected. But I was surprised that the HERO7 White kept going--it went for 3 hours and 3 minutes. That's a real difference and a big tick in the newer camera's columns. Battery. 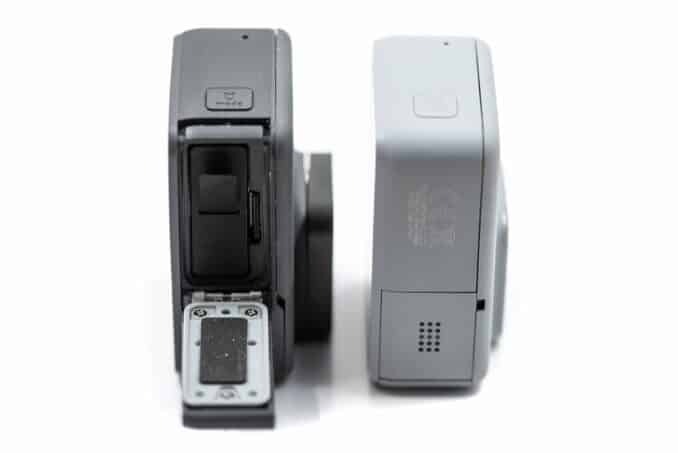 One of the most important functional differences between the cameras is that the HERO (2018) uses a removable battery. The battery itself is the same one that's used in the HERO7 Black, HERO6 Black, and HERO5 Black. Having a removable battery is useful in several ways. It means you can keep charged spares on hand and simply swap them out when one dies, a much quicker process than hooking the camera up to an external power source and waiting for it to charge. The HERO (2018) has a door on the bottom that covers the battery and memory card compartment. Beacause it has a built-in, non-removable battery, the HERO7 White doesn't have that door. The HERO7 White has an internal, built-in battery that can't be removed. So the only way to charge the battery is to connect the camera to an external power source. Charging. Both cameras use a USB-C connection for charging. The USB-C ports are in the same corner of the camera, but they're not in precisely the same spot. And that has an important consequence: the HERO (2018) is compatible with the same extended batteries that work with the HERO5 Black, HERO6 Black, and HERO7 Black. The HERO (2018) is much more limited, in that it doesn't work with any of the batteries that clip on to the USB-C port. GPS. Neither of these cameras can save the GPS geolocation information in the metadata. Technically, the HERO (2018) has the hardware inside to do it, but it's not an options that's available using the GoPro-sanctioned firmware. 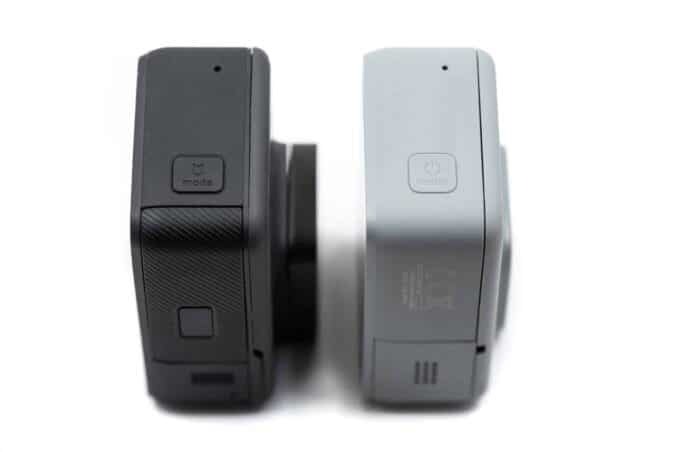 In general, both cameras can work with the same standard GoPro mounting connections. So for things like standard grips, bobbers, chest harnesses, suction cups, or bike mounts, they'll both use the same ones. There's overlap with the types of frame housings they can use, but there are some things to watch. 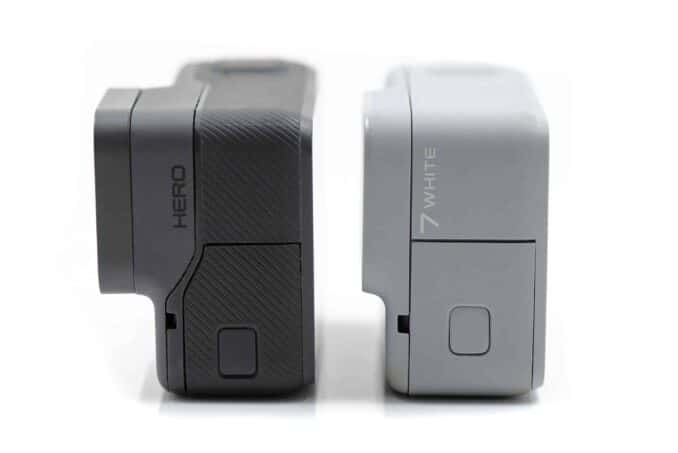 The HERO7 White, for instance, isn't compatible with the SuperSuit dive housing because of the different lens port. There's again overlap when it comes to power accessories, but there are some crucial differences. The most important is that the HERO7 White has a built-in, non-removable battery. So you can switch it out for a charged spare. Both charged using a USB-C cable, and you can connect them to the usual array of USB power sources, from AC wall adapters to powerbricks. But some extended batteries that use a fixed USB-C connection won't work on the HERO7 White because the port is in a different place. Both can use the same kinds of memory card: a microSD card. They have basically the same speed requirements of the card, so the card you use in one will work in the other. If you're after some specific recommendations, I've put together some of the HERO7 cameras here and for the HERO (2018) here. You can find the HERO7 White at stores like Amazon, B&H Photo, and directly from GoPro.com. The HERO (2018) is now discontinued, but at the time of writing this, you can still find it at some retailers. Here's a comparison table for a quick side-by-side reference. In-Camera Image Enhancement WDR No. Thank you for your expert opinions. I have chosen GoPro Hero (2018) at the end. Enjoy shooting with it! They're very good cameras. Any thoughts on the upgraded Akaso with the touch screen? I haven't yet tried it (but it's in the queue). The addition of the touchscreen obviously changes one of the points I raised. I don't know whether it comes with a housing back door that allows for the touchscreen to work while in the housing. Trying to find an action camera for my 11 year old daughter for Christmas. Simplicity and ease of use is important. I'm stuck on deciding between the Akaso, the GoPro White and the GoPro Hero. Love the price on the Akaso but would hate for it be to complicated for her. Any thoughts? My kids are a bit younger than that, but in thinking about which of those I'd be most inclined to hand them, I think I'd lean toward the HERO7 White mainly on the ease-of-use issue. In practice, the HERO really isn't that much more complicated, but the White does have a slight edge. The Akaso is a a very capable camera, especially for it's very attractive price, and I have a lot of good things to say about it. But there are a few things that together work against it in this case. It has more options to work through, which inevitably adds complexity. Its screen isn't a touchscreen, and in my experience kids find touchscreens much more intuitive to use because they're used to using them on other things like phones and tablets (just this morning, one of my kids picked up one of my other cameras without a touchscreen and was trying to swipe on it to get it working). And it's not waterproof by itself--you have to put in a separate housing (which comes included) to give it the extra protection. That's not hard, but it's also another moving part to remember (and lose). So, in short, I'd be more inclined to go with the HERO7 White or the HERO (2018), with the White having a very slight edge if you can find them for similar prices.